The first Cardiff Blues Heineken Champions Cup campaign for five years finished in emphatic style on Saturday, hopefully providing a platform to return next season. 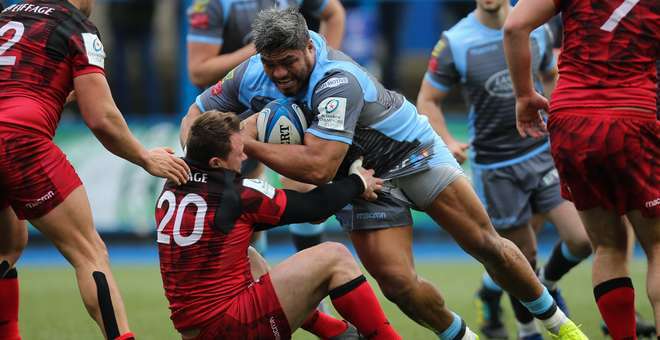 John Mulvihill, who was pleased with his side's performance, made eleven changes to the team that pushed Glasgow last week as Lyon arrived at the Arms Park, with only Rory Thornton, Josh Navidi, Harri Millard and Owen Lane surviving. Rhys Carre and Liam Belcher led the young contingent, Big Nick Williams captained the side for the first time, while Welsh internationals Josh Turnbull, Tomos Williams and Gareth Anscombe all played before heading off to report for Six Nations duty. The opening 10 minutes were a back and forth affair as both sides tried to assert territorial dominance, but a stream of turnovers and individual errors prevented either side coming out on top until a clever kick in behind from Lyon winger Alexis Palisson was taken back over his own try line by Owen Lane. A series of strong Lyon scrums followed, and although one lengthy attacking set was repelled, a penalty advantage saw the visitors go back to the scrum with referee Karl Dickson losing patience with Cardiff Blues and heading under the posts. The French side went to press their advantage with a midfield break, but a superb scramble tackle and jackal from Josh Navidi put an end to that and set up the home side's response to going behind. From first phase ball Jarrod Evans found Harri Millard running a beautiful short line to burst through the defence. He was eventually brought down by Xavier Mignot, but a quick recycle saw Evans through the ball wide and Aled Summerhill eventually battled over the try line on the left wing. With the half-hour mark approaching it was another Millard attack, this time a half-break from another short line off Evans, that would set up a try as Lyon infringed on the floor in scramble defence. Cardiff Blues kicked to the corner and although it seemed the attack might be slowing up as the ball went to ground, Evans pounced to draw in defenders before putting Millard and Summerhill into a two-on-one on the outside, the latter grabbing his second try of the half. Gareth Anscombe kicked the first conversion but missed the second, and that would cost the home side an ability to avoid a half-time deficit when, a few minutes before the break, Lyon struck. An Evans clearance kick stayed in-field and Toby Arnold fielded the ball on halfway, breaking one tackle on the return before getting his hands through the next tackle and offloading for a rampaging Mignot to power over in the right corner. Palisson nailed the conversion and Lyon found themselves with a 12-14 half-time lead that was perhaps a touch unlikely. However, the lead only lasted three minutes of the second period as Cardiff Blues scored the try of the match. A turnover in midfield saw Nick Williams brilliantly flick the ball one-handed to Gareth Asncombe. Possession was shifted on to Tomos Williams out wide who beat that piece of skill with a one handed offload to release Owen Lane down the right. Not to be outdone in the showboat stakes, Lane promptly moved the ball into two hands, stood Palisson up and pinned his ears back to speed around his opposite winger for a brilliant score, converted by Anscombe. With the lead in the back pocket Cardiff Blues were visibly growing in attacking confidence, forwards at first receiver pulling the ball back for the dual playmaking threat of Gareth Anscombe and Jarrod Evans to move the opposition defence around freely. It was the forwards who helped break the deadlock next though as a Liam Belcher pop pass freed Josh Navidi before the flanker offloaded for Tomos Williams to sprint under the posts. That was the bonus point secured, and on the hour mark the game would be put beyond doubt. A perfectly weighted Anscombe kick found Aled Summerhill on the left wing, he went to move the ball back inside but a Lyon hand slapped the ball backwards into the in-goal area, and Lewis Jones was the quickest to react, crowning his 100th Cardiff Blues appearance with a try. At this point the hosts rather took their foot off the gas and Lyon tried to salvage some pride with Olly Robinson sent to the sin bin in the final minutes, but the defence held firm for a final scoreline of 33-14. In the end a very respectable way to end the Heineken Champions Cup campaign, with John Mulvihill's side reaching double figures in points and finishing third in the pool, a pleasing campaign all in all. These last two weeks have seen Cardiff Blues shake the shackles off that have been hindering the attacking game over the festive period, moving the ball to the backs quickly and even developing our offload game on Saturday to help create 14 line breaks. Hopefully this will give us confidence going into the Six Nations period of Guinness Pro14 games, starting next week with a massive home game against Connacht.